JVC's Handclap & Gesture Recognition TV | OhGizmo! Here’s some more clever innovation coming out of the CEATEC show in Japan. JVC has been showing off a TV that is able to detect and respond to both sounds and gestures made by the user, basically replacing a complicated remote control. You can clap your hands to control simple functions like adjusting the volume and changing the channel, or point at large icons on the screen with your finger to access more complex menu options. 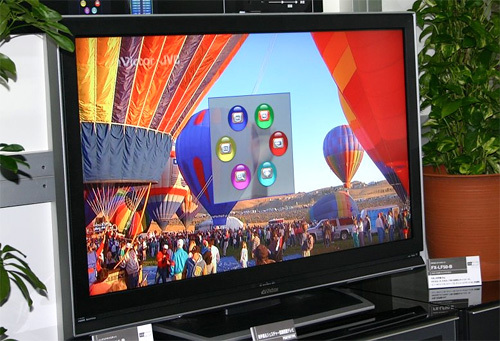 The TV’s microphone also uses a special filter to prevent it from responding to sounds coming from the show you’re watching, or other clap-like sounds in the room. (Like a slapfight maybe?) Sounds to me like the user-friendly concepts behind the Nintendo Wii are starting to make their way into other areas of electronics. Given it takes certain family members of mine several minutes to locate the volume button on their remote, I wouldn’t be surprised if features like this became very popular. Unfortunately though at the moment JVC has no plans to make this anything more than a trade show tech demo. I have been able to turn stuff on and off by clapping in my house for years.